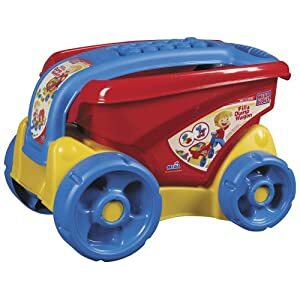 Over the summer we purchased the Mega Bloks fill and dump wagon and ever since both Roo and Tigger have had hours of fun and enjoyment playing with it. 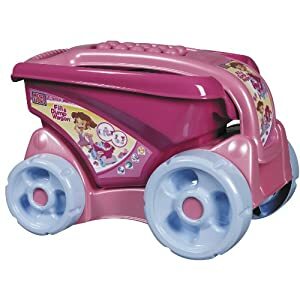 Included is 25 chunky mega bloks inside a sturdy pull along wagon. The handle folds over the top of the dump bucket when not in use or can be used for building on top of. The wagon has nice big wheels that are easy to turn. Available in two colour options, which makes it suitable for both sexes. The wagon is suitable for age 1+, although Tigger has been happily playing with it since he was about 9mths. The wagon is very strong and durable, Tigger has climbed all over it, used it as a standing aid, as well as chewed on it when he was teething. Disclaimer: Non-sponsored post I bought and paid for items with my own hard earned money. Just sharing some product love with you. As always my thoughts and opinions are my own.